As the weather is getting colder day by day, it's only right to make sure that not only are you keeping warm, but that you keep your body hydrated and healthy as well. The cold during the Winter months can be really hard on our skin if we're not doing our best to keep them moist. Softlips not only has a great line of different flavors of lip moisturizer, but each one is packed with Vitamin E to help with chapped lips and to keep them looking soft and healthy. Definitely something we all need. especially these next couple of months. 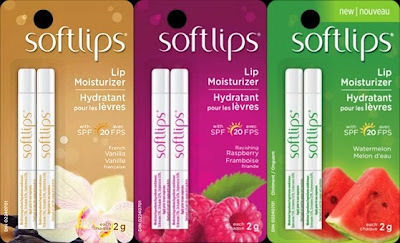 All of the lip moisturizers from Softlips has an SPF of 20, which is great because it's protecting our lips and keeping them soft and hydrated. I was sent a few of their double pack lip moisturizers last week and have been loving wearing them. I got sent French Vanilla, Ravishing Raspberry and their latest flavor, Watermelon. I've tried all three and hands down I'm loving Watermelon the most right now. I love the freshness of the scent and how easy the lip moisturizer glides on your lips without leaving a waxy feeling after you're done using it. Another thing that I've always loved about Softlips is how nice and slim their tubes are. I love that it's not too big and that it can fit in the back of your jean pocket to carry with you anywhere. These would make perfect stocking stuffers this Holiday season. You can find Softlips at any local drug store or big retailers, like, Walmart, Target retailing at around $4.99 for the double packs.